Welcome to Ramsey's Retreat, located on 1.7 acres in a private subdivision. 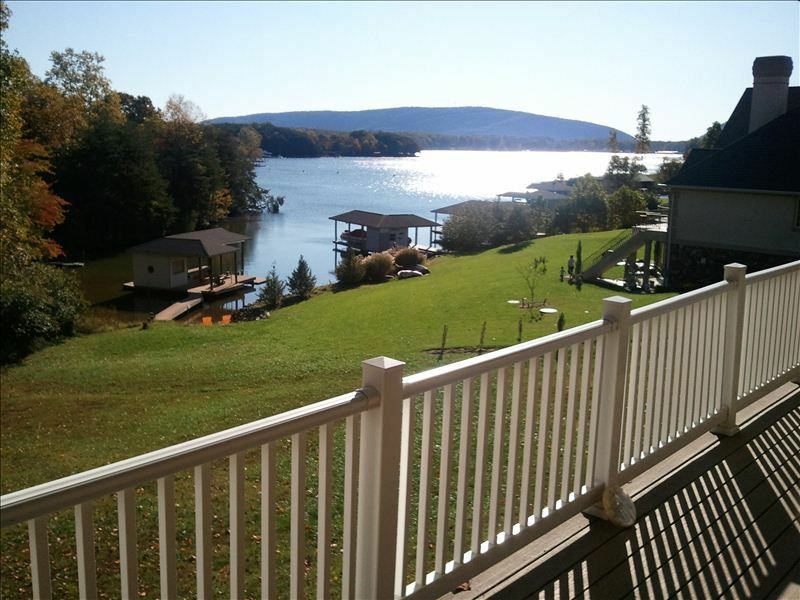 This beautiful spacious home is nestled at the end of a quiet cove, surrounded by shade trees, with a spectacular view of the lake and mountains. It is comfortably furnished with hardwood floors and tile throughout the home. There are 3 bedrooms with queen sz. beds & one bedrm. with two single sz. beds. Upstairs bedroom has additional A/C unit added 2019. The Master bedrm. walks out onto deck overlooking lake. Spacious living rm. has satellite TV/DVD player & gas fireplace; & a formal dinning rm., both overlooking the lake. Fully equipped kitchen has stone countertops and a breakfast nook with views of lake. There are three full sz. bathrooms with Jacuzzi tub in Master bath. Basement, as game room, offers a ping pong table, dartboard, putting golf strip, & another TV. Curl up with a book on the back deck or take a short walk down to the private dock & beach area. Enjoy swimming in the no wake cove or a relaxing ride in a paddle boat. Many type of wild life keep the excitement going, as well as fishing off the dock. For nature lovers there is SML State Park, Blue Ridge Parkway, & the Peaks of Otter w/ a wide choice of hiking & bike trails to choose from. You can take a ride on the Virginia Dare to see the lake while dinning for lunch or dinner. The area is rich in history. You might want to visit the Booker T. Washington Plantation, D-Day Memorial in Bedford, Thomas Jefferson's Poplar Forest, or take a tour to see how SML Dam was constructed. A drive on the Blue Ridge Parkway is a must, taking in the beautiful views of the mountains and breath taking colors of Autumn. Across our cove & within view of Ramsey's Retreat is Mitchell's Point Marina where you can rent boats of all kinds. The Marina has a restaurant with great food & offers free wireless internet. Within a short drive or boat ride there are all kinds of restaurants from Chinese to Italian, to southern home cooking. Also visit downtown Moneta or Hales Ford Bridge area for restaurants, shopping, & entertainment. This is the perfect get away from the hectic pace of everyday living. Additional A/C unit in upstairs bedroom, added 2019. Wifi From April thru Oct.
Deck has patio table & chairs, & wicker furniture. Patio has glider & swing overlooking lake. Dock has adirondack chairs. Paddle Boat. Library nearby. Ping pong table, Putting Strip, Dart Board ~ Covered deck, patio.and dock. Had a great weekend at this home. House was clean, kitchen was great to cook in and well-supplied. View of lake was beautiful. We also enjoyed using the paddle boat on the lake. Fireplace was wonderful for cold nights. Thank you for this review! Glad you all enjoyed your stay.and thanks for choosing Ramsey's Retreat. Our family of seven rented this beautiful home for the weekend while we were attending a family member's wedding. It was only 10 minutes away from the venue and provided all the comforts we needed.The porch overlooking the lake was perfect for relaxing with a morning cup of coffee. We used the dock to fish, the peddle boat, and the little sandy beach was fun for our 14 month old grandson. A previous review stated that the upstairs bedroom was very hot, however, since that review the owners added a fan and upgraded the a/c unit. We left the thermostat switch on "fan" to circulate the air and our son was able to sleep comfortably. It was 90 degrees in the day. I would recommend this home and we would definitely like to return for a longer stay to enjoy the lake. The house was beautiful with an amazing view of the lake. Very quiet area and dealing with the owners of Ramsey’s Retreat was amazing! Not sure where some of the people are getting some of the things in their review such as they do not supply anything in the house. We had a party of 8 and had everything there we needed except for towels and bedsheets but not sure who would ever want to use that stuff after a stranger. We are looking forward to going back next year and could not have asked for a better house or location to spend vacation and 4 birthdays at! Thank you for sharing your enjoyable vacation & birthday celebrations at Ramsey's Retreat! Glad to hear it was a fun time. We really enjoyed our stay at the Ramsey Retreat. The property is perfect - with a little beach and dock with shallow water surrounding. Our kids spent most of their days jumping off the docks and playing in the water which was perfect! The only thing to note for families with small children - there are only two bedrooms on the main level - the other bedroom is upstairs. But everything was wonderful and the house was clean and nice! It was our first time to SML and we will be back! Thank you for sharing your fun time at our lake home:) Glad you all enjoyed your stay! Hope you can visit again. We have visited SML multiple times & have developed a preference for the Huddleston area--thus our attraction to this home. The wider coves & access to the dam are fantastic. John & Donna are very responsive relative to rental agreements, payments, & general questions/concerns. We were the first to be able to test & use the WiFi, which performed very well during our stay (despite a lot of evening storms). The main living spaces (living room, kitchen, dining) were nicely appointed & comfortable. We brought our own crockpot based on prior reviews, but there was a small one already on site when we arrived. The back deck & general location are GREAT. The cove was easy to navigate with our pontoon rental, & the neighborhood is very high-end. It was quiet & safe enough to take evening walks/do some jogging. Fishing in the cove yielded sun perch & catfish, so the kids had a great time with that. CON's: The 2 main floor bedrooms were markedly better than the kid's attic space & the basement bedroom. The attic was suffocatingly hot when we arrived, & the fans did little to help in a closed room. We were making plans for the kids to crash in the living room when my husband decided to experiment & re-locate the oscillating fan in front of the window. With the window slightly cracked each evening & the fan circulating cool night air, the room cooled off considerably --& it was tolerable all week. Long term, though, this room needs a separate HVAC unit to be fairly advertised as useable space. The basement bedroom was also a bit of a 'short straw' as it smelled quite musty on arrival (particularly at the bottom of the steps; less so in the open area). We bought 2 plug-in air fresheners, & that seemed to alleviate most of our concerns. It met our needs for additional, private space, but it was not equivalent to the upstairs spaces. The bedding (which is fairly depicted in the web photos) is past it's useful life. With the exception of the MBR bedspread and 2 of the 4 pillows there - it all needs replaced. If you have space, we'd recommend bringing your own. We always leave the lake having had a great time & this was no exception. A few tweaks on upgraded linens & climate control would definitely keep this property on our radar for a return trip. Thanks for your feedback & staying at Ramsey's Retreat. One of our best family vacations ever! Ramsey’s Retreat was perfect! We felt right at home. The owners even called to make sure everything was ok and to see if we needed anything. Thank you for sharing your home with us!! State Park, convenience store, two restaurants and pub within two miles. Large variety of restaurants within 10 miles. Marina with cafe and boat rentals across cove.